These creative faux-log containers are long-lasting and work outdoors or indoors. Available in vertical 12" diameter or 16.5" horizontal versions. These weather resistant and UV resistant containers come in oak or birch styles. Made of lightweight polyurethane. 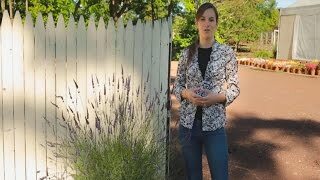 Growing fragrant lavender in containers is easy and looks amazing. Surreal Faux Log Planters is rated 5.0 out of 5 by 3. Rated 5 out of 5 by Mikey G from Looks awesome! I've been thinking about hollowing out a log to make a planter forever. I saw this and tried the vertical Oak version. It looked so convincing that I went ahead and got the vertical birch one also! If you allow the plants to cover the top edge the effect is amazing realistic. And they weight next to nothing! Rated 5 out of 5 by Scouter from Amazingly realistic! I ordered the large size oak planter, and it's AMAZING . . . super lightweight, completely weatherproof, and completely realistic. Even up close, it looks (and feels) real, both the texture and the color. Looks great with a small camellia planted in it in a little shady spot . . . see surrealplanters.com for more information. They don't sell direct, but the website gives a lot of information about the product, how it's made and then handpainted. I'm ordering one of the birtch planters, as well. I think it will look particularly great in December planted with a pointsettia, amaryllis, paperwhites, etc. I plan to plant some bright yellow daffodils in the oak planter next year.